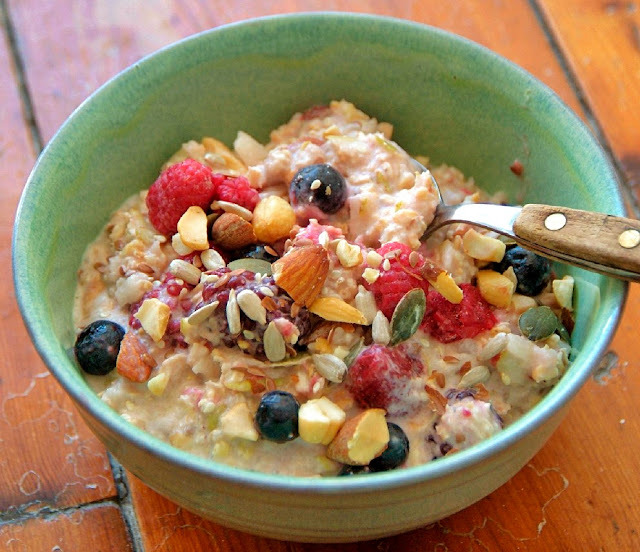 I have blogged about bircher muesli before but I simply have to blog about it again. Now there's not much more I want to say about it other than that I must have made at least 10kg of it over the last month as the family and their guests have been wild about it. It must be the recipe which has been most requested so far. Now if that's not a good enough reason to try it, then what is? If you want to read what I wrote about it before, click here. The only real deviation to the ingredients in the recipe below is that I have been adding lots of cinnamon rather than vanilla and recently I have been making fresh pressed apple juice in the juicer rather than using store bought juice. I think I may just pop over the to fridge and get myself a bowl right now! What exactly are raw rolled oats? Would all oats be raw if you don't cook them and what does rolled mean? What's the health advantage of having them raw and rolled? But on a taste level, I prefer rolled oats also because it has a great texture once its soaked. The instant or quick cook oats gets very gluey and mushy. In SA the easy store bought brand would be tiger oats or go to the health food section of the store and they usually have rolled oats. For raw rolled you would need to go to a health store. Wellness warehouse in kloof street is always a treat to visit!